I haven’t added much of late because I’m going through a rather intense self-study refresher course in the Industrial Revolution, both in Britain and in the US. There were really two industrial revolutions or two phases of the same revolution. The first occurred primarily in Britain and really caught hold in the 18-teens to the 1840’s. The second happened in both Britain and the US and began in the 1850’s and really took off through the end of the century. So many things changed about work, about how people lived, about materials and technology during these upheavals. There’s a very good reason they’re labeled “Revolutions.” I’m working at placing the steel pen industry within these two periods. It’s clear that the British steel pen industry was a product of the first phase of the industrial revolution. It benefited from advances in abundant and cheap steel of high quality, the greater availability of quality machine tools, and the innovations in assembly lines and management that occurred at this time. In the US, the early pen makers seem to still be working in the workshop model of the previous century, until we get to the 1850’s. Some of the early makers, like Myer Phineas, and Mark Levy are complete mysteries. I suspect they may have used a kind of hybrid workshop, assembly line approach. I think this because we do know they produced relatively large numbers of pens of various types, but they hadn’t yet adopted the manufacturing practices of the British factories. A workshop large enough would most likely have incorporated some of the practices already being adopted in manufacturing in the US at the time. But this is just speculation. The first pen makers who we know used true, industrial processes were Washington Medallion, Harrison & Bradford and Esterbrook. This is directly a result of bringing trained British pen makers over to implement the British model here in America. This would be a recurring model for many new industries in the US. Many of the early industries were at least inspired by, if not wholesale stolen from, their British predecessors. I’m not sure how far I’ll take this because there is so much into which one can immerse oneself. Labor practices, including women in the workforce, workforce organization, is one area ripe for investigation. Tariffs and protectionist policies and their influence on the growth of the US steel pen industry is another. And there are many more. I just wanted to put it out there why it’s been so quiet. It doesn’t mean I’ve stopped the research, it just means the research is beginning to become richer and there is so much more to find. I’ve added the last main entry on Washington Medallion. This entry is the longest entry yet. It covers the rest of the company’s history from the troubled times of 1860, through the numerous lawsuits, and the crazy Harrison & Bradford period. 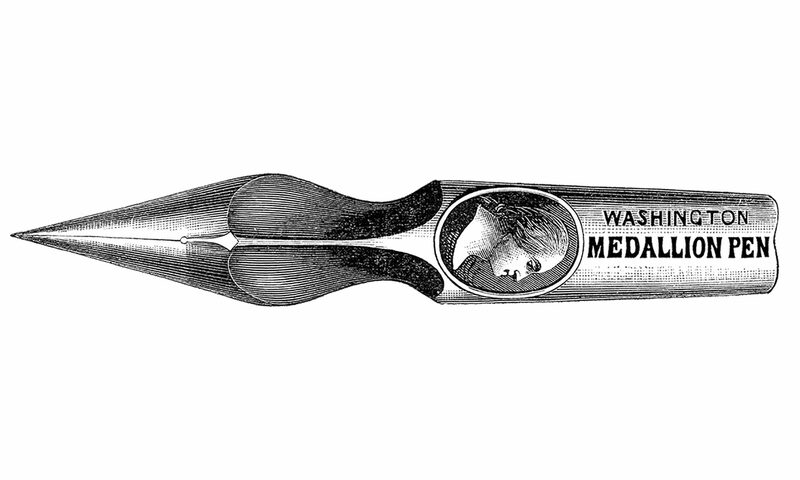 The Washington Medallion Pen Company is not well-known, but it set so many precedents for the US steel pen industry. They were the first to bring skilled British tool makers from Birmingham, they were the first to truly advertise nationally. Others had sold their pens regionally, but Washington Medallion’s marketing went further than any had before. Through their lawsuits they also set legal precedents for trade mark protection and changed how the steel pen makers who came after designed and sold their pens. I’m not completely finished with Washington Medallion. There are a couple of other topics of interest to cover. Next I will take the article from United States Magazine I’m referenced multiple times, and go over it more completely, as it is a fascinating, and detailed, glimpse into pen making technology and techniques in the middle of the 19th-century. And in case you missed it, I also recently added a short entry on stub steel pens in response to several questions I’ve received. As always, I appreciate feedback and questions, and I hope you enjoy the latest entries. As I was starting to write a post about equipment, I realized I should probably write up a quick statement of ethics for my site. All public sites which end up reviewing or talking about commercially available products or services should have one. So, this is mine. I don’t accept free or discounted products or services. All products, services, sites, etc… I mention on my blog are there because I value them and use them myself. Should anyone care to send me new products, highly unlikely and there wouldn’t be much I’d be interested in, if I wanted to keep it I would pay for it. Vintage objects are in a different category because these are not, generally, commercially available objects and I doubt that sending me a box of Turner & Harrison pens, as an example, would corrupt me or enrich anyone else. I would only accept such objects if they contributed to the historical understanding and mission of this blog. I may, rarely, place a link to an item on Amazon or another commercial site as part of their affiliate program. I will only link to items I use and recommend, and the pitiful amount of money this may or may not bring in will help defray the minimal costs of this blog. I send you to a useful item, I may get a few cents back. That works for me and it will be obvious when it happens. This site is not about modern items being sold today, so this will be a very rare occasion when or if it happens. Why am I writing this? Mainly because these days it’s difficult to know to whom you should listen. I’m just a guy with a strange hobby who likes to share information. The opportunity for me to be corrupted by Big Steel Pen, and sell my soul for a slice of their riches is, um, less than likely. But I also want the readers of this blog to feel comfortable should I ever recommend someone or something. I want you all to know that I do it because I truly believe it’s the right thing, a good thing, and for no other reason. Hopefully that’s the last I have to say about that.